Marketing was arguably one of the first lines of business to understand the impact data could have on growth and profitability. Indeed, an article in Forbes acknowledged that of all the ways businesses are looking to big data to streamline operations, “marketing is perhaps one of the most important”. On this webinar, you’ll hear how Contactlab has leveraged data collected over the past 15 years as a direct marketing company as a basis to completely re-engineer its business model to create new data-driven products and revenue models. Luca Olivari, chief data officer at Contactlab, will discuss findings on how to ingest, enrich, analyze and activate digital data, transactions and contextual information. 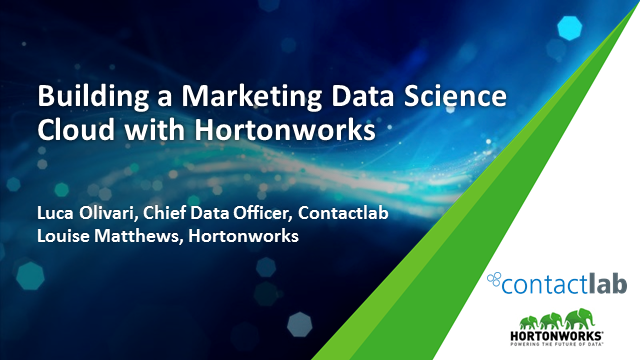 He’ll also share why Contactlab opted to partner with Hortonworks and how its transformation has been accelerated by building a marketing data science cloud based on Hadoop. Technology professionals will learn from Contactlab’s experience through practical tips on how to become data-driven and make data accessible to everyone. Equally, marketers will get some fresh ideas on data science projects to increase customer engagement and revenue.